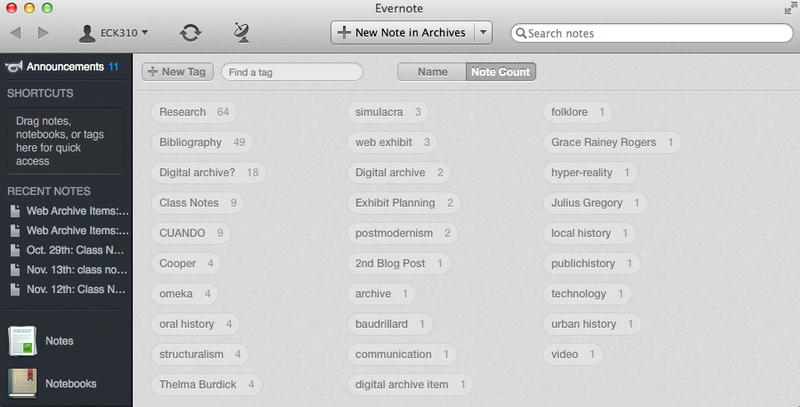 Evernote is a great note taking tool, that should be utilized by anyone who likes to keep everything in one place. 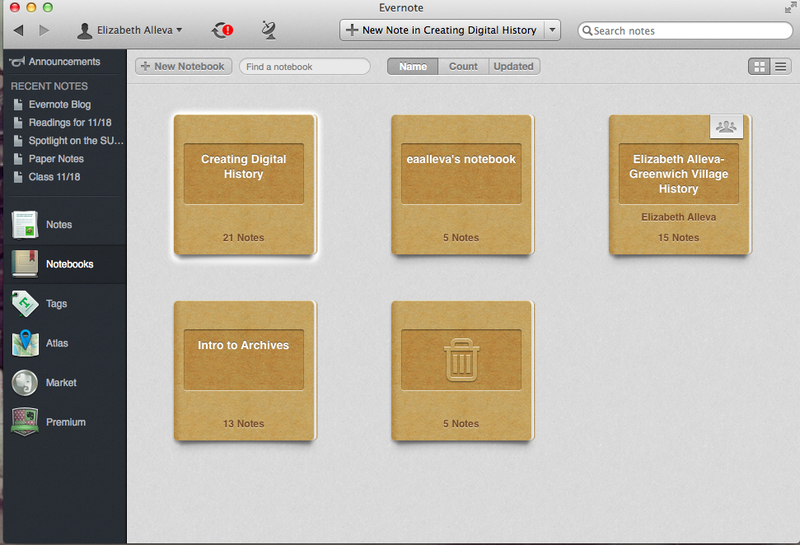 I was first introduced to Evernote last year, but did not start using it till our Creating Digital History Class. However, I wish I started using it earlier as I find myself more organized than ever with it. It is great as it can be accessed with their app on your phone, tablet, and computer, in addition to their website that can be accessed using any internet browser. 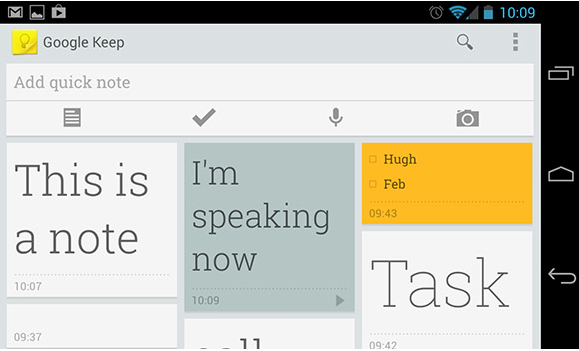 Upon signing up for a free account, a user can create notebooks for anything that they need. My notebooks include a personal notebook for any to do lists I make or any interesting articles I find; a notebook for each of the classes I am in; and a notebook for the Greenwich Village History project. Each notebook contains information that I can easily access on my laptop or on my phone during my commutes to and from the city. 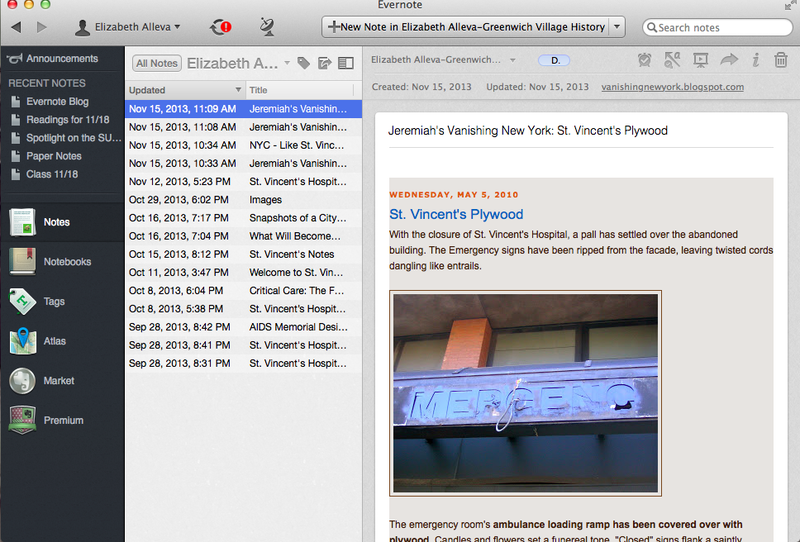 The easy accessibility of Evernote is one of the main reasons that I use it for everything. I love that it has an app for your smartphone, which I utilize all the time, whether it is reading for class on the train or writing something down on the go, it is extremely useful. My individual notes are easy to read as I constantly use the bullet points or numerical list format that Evernote allows you to use. For my notes on the readings for class I am able to clearly label each reading and organize my thoughts in bullets underneath each heading. I then apply whatever tag is necessary, in this case the tag would be Reading Notes. The option to tag was something I only recently started using. 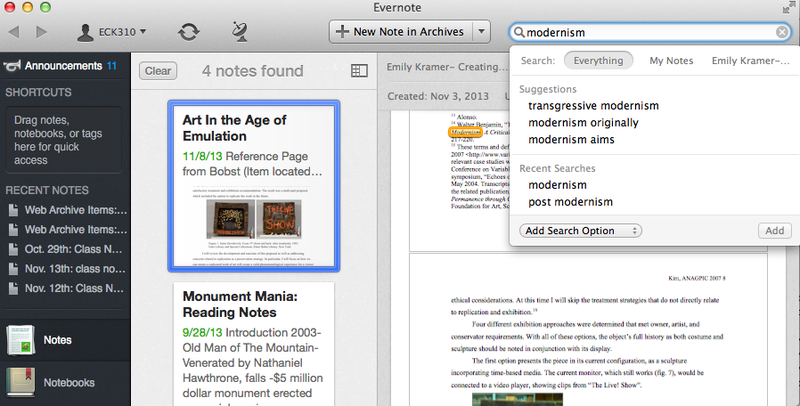 It allows for an easy way to search through any of the notes or articles that you have saved on Evernote. 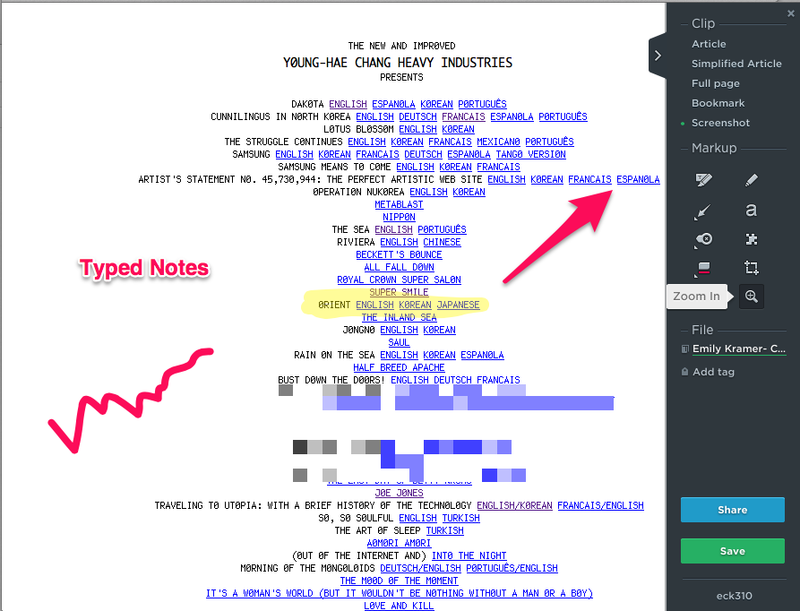 Another great feature of Evernote is the web clipper. This tool allows you to clip articles from the internet and send them straight to their perspective notebook. The little elephant head appears at the top of your browser. Whenever you come across something of interest you just press the button and it clips the article. 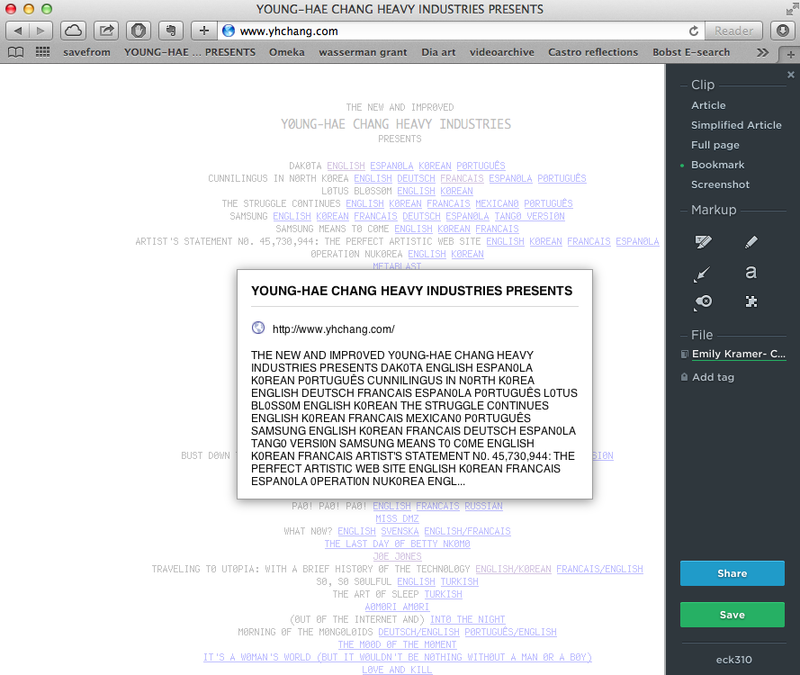 The web clipper has become an integral part of my research for my Greenwich Village Digital Archive Exhibit. I am able to organize all the articles I am using for reference, as well as maintaining the websites that any of my images in my archive come from. I have also been writing any notes I take for my exhibit on Evernote. Numerous times I find myself without a laptop and finding something useful for my exhibit. I can easily access my notebook on my iPhone or the web browser and make note of my findings. Evernote is very alert to the needs of its users. Their website includes a bog where users can post any questions or concerns that they have. It was here that I personally was able to understand how to use the web clipper tool. The blog is divided into six pages: Latest, Product Updates, Tips + Guides, Community, Partners and Our Notes. Each tab is full of practical information for new and old users. I have found that the Tips + Guides portion of the blog is the most useful as it offers many troubleshooting posts as well as new and different ways to utilize Evernote, like creating a cookbook with it. It was here that I personally was able to understand how to use the web clipper tool. After having looked at their blog many different times I have realized the wonders of Evernote and am glad I had the opportunity to finally utilize it. 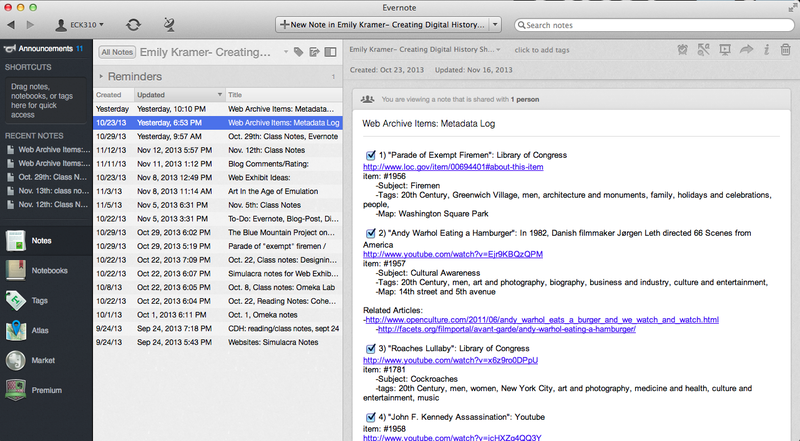 My student life has drastically changed with Evernote as I find it so much easier to be organized in all of my classes. 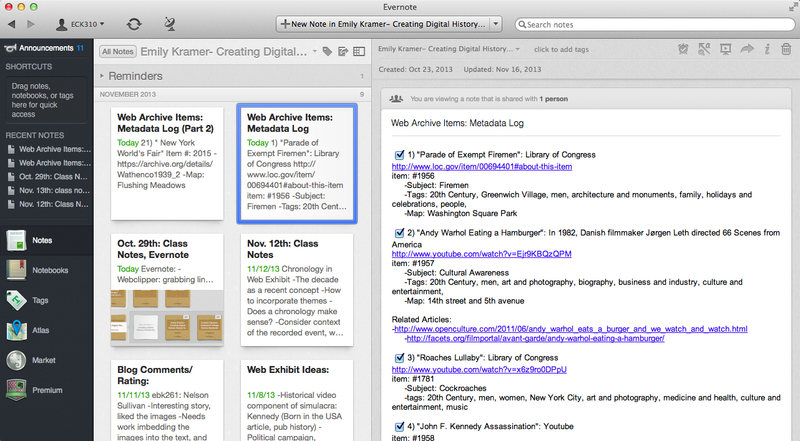 I plan on continuing to use Evernote in my future classes.